Patients have a new treatment option for debilitating lower back and leg pain. 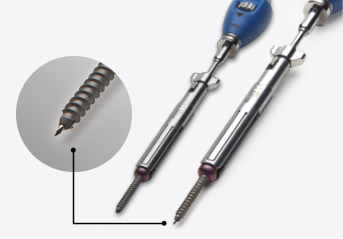 The TOPS™ device offers an alternative solution to spinal fusion surgery for patients with moderate to severe lumbar spinal stenosis, degenerative spondylolisthesis and related spinal conditions. The TOPS Posterior Arthroplasty System addresses two critical functions of the spine – maintaining stability and preserving motion. In a Posterior Arthroplasty procedure, your surgeon removes the bony elements that press on your nerves. Thereafter, the doctor implants the TOPS System to stabilize and reestablish a controlled range of movement of the lumbar spine. Patients with symptoms of lower back pain, sciatica, numbness, tingling, burning sensation, and/or radiating leg pain while walking (spinal claudication) regain their ability to bend, flex, walk, and enjoy the normal activities of life that were so debilitating before surgery. The TOPS™ System is a mechanical implant device that replaces the bony and soft tissues removed during spinal decompression surgery. This type of surgery is performed as a treatment for lumbar spinal stenosis (narrowing of the spinal canal), spondylolisthesis (slipped disc) and for facet joint arthrosis/cysts. The TOPS System is designed for use at a single level between L2 through L5 — the segments most commonly affected by spinal stenosis. It can also be combined with the Versalink™ Fusion System for multi-level disease between L1 and S1. 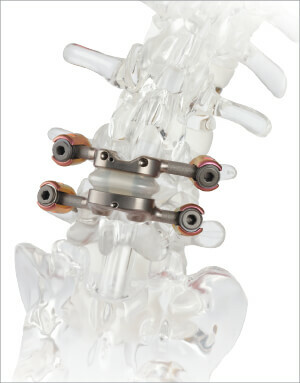 For such patients the TOPS System serves as an important transitional segment between the rigid fixation of fusion and disease-free spine segments. The TOPS™ System allows motion in all directions – flexion, extension, lateral bending, and axial rotation. At the same time it also blocks sheer forces, which are naturally exerted on the lower spine and can be detrimental, especially for patients who already have a slipped disc or spondylolisthesis. This cannot be achieved with a decompression-only procedure or with an intraspinous or intralaminar device. 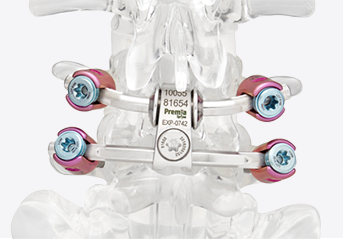 Clinically proven to provide immediate and sustained pain relief and improvement in quality of life, Premia Spine’s TOPS™ System has also been demonstrated to provide excellent outcomes for appropriate patients. The TOPS System provides three major benefits for the treatment of spinal stenosis, spondylolisthesis and other diseases of the facet joint. First, the procedure stabilizes the lumbar spine and reestablishes a controlled range of movement. Second, patients regain their ability to bend, flex, walk, and enjoy the normal activities of life. Third, and most importantly, patients experience immediate and sustained pain relief. Clinical studies conducted since 2005 show the TOPS System alleviates persistent leg and low back pain for patients with moderate to severe spinal stenosis with or without spondylolisthesis (a slipped disc) and facet arthrosis (bone spurs). Do you have symptoms of spinal stenosis? Click on the testimonials to hear from people who suffered as you do. And talk to your doctor about all your treatment options to find out if TOPS is the right solution for you.